Maxwell "Max" William Ward, OC AOE (born 22 November 1921) is a Canadian aviator and founder of Wardair airlines, at one time, the third-largest air carrier in Canada. Max Ward was born 22 November 1921 in Edmonton, Alberta. After completing Grade 11 at Victoria High School in Edmonton, and working at the Canadian National Railways, he joined the Royal Canadian Air Force (RCAF) in 1940. During the Second World War, Ward received his wings on 2 November 1941 and was assigned to training command as an instructor as part of the British Commonwealth Air Training Plan. He was stationed at various training bases for the duration of the war. While in Regina, Ward married Marjorie Doretha Skelton in 1944. In 1946, after leaving the air force, Ward worked at a few other jobs before joining with Jack Moar, who was flying out of Yellowknife, Northwest Territories. Wishing to start a flying service to the north, Ward purchased a small de Havilland Fox Moth biplane to carry both passengers and freight and started his first company, Polaris Charter Company. When he was unable to obtain a commercial flying licence on his own, he found a partner and established Yellowknife Airways Limited. The skirmish with bureaucracy was the first of many that punctuated Ward's aviation career. This was a short-lived operation that was dissolved in 1949. After two years in Alberta, including flying for Associated Airways, Ward worked in construction before returning in 1951 to Yellowknife to work for Associated Airways, but he lost his job the next year. A Wardair Boeing 747-100 in 1983. After flying as a charter pilot for two years, the opportunity arose to get a license for Ward to operate his own commercial air service. With this Class 4B Charter licence and a brand new de Havilland Canada DHC-3 Otter single engine prop aircraft, Wardair was formed in May 1953. Wardair operated within Canada until the 1960s when Ward started looking at overseas charter as a business opportunity. He took Wardair public in 1961 but retained a controlling interest. By the mid-1970s, Wardair Canada had developed into Canada's largest international air charter carrier and from 1984 flew scheduled routes. After another 20 years of economic rollercoasters, competition from the likes of Air Canada and Canadian Pacific Airlines and government regulation, Ward finally sold Wardair in 1989 to PWA International, the parent company of Pacific Western Airlines, which had also acquired CP Air. Wardair then became part of the new Canadian Airlines which operated as Canadian Airlines International. In 1991, Ward published his autobiography, The Max Ward Story. 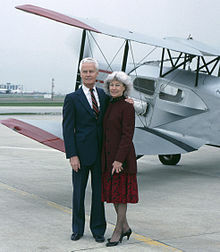 Max and Marjorie Ward pose in front of Fox Moth CF-DJB. This was the Fox Moth’s last flight before going to the Canada Aviation and Space Museum in 1989. ^ Ward 1991, pp. 15–16. ^ Szurovy 2004, p. 112. ^ McCaffery 2003, p. 41. ^ McCartney 2006, p. 6. McCaffery, Dan. Bush Planes and Bush Pilots. Toronto: Lorimer, 2003. ISBN 978-1-55028-765-3. McCartney, Denny. Picking Up The Pieces. Bloomington, Indiana: Trafford Publishing, 2006. ISBN 978-1-55369-602-5. Szurovy, Geza. Bushplanes. Minneapolis, Minnesota: Zenith Press, 2004. ISBN 978-0-7603-1478-4. Ward, Max. The Max Ward Story: A Bush Pilot in the Bureaucratic Jungle. Toronto: McClelland & Stewart, First edition 1991. ISBN 978-0-7710-8302-0. This page was last edited on 14 November 2017, at 11:21 (UTC).